File photo of members of United Behind the Locals standing on the vacant land. LOCAL RESIDENTS HAVE have expressed their frustration at what they call serious delays in the development of 640 homes on public land in north Dublin. Campaign group Unite Behind the Locals said in December that they were staring into their fourth Christmas in a row in which land earmarked for development remained vacant. The land in question is at the Oscar Traynor Road between Santry and Coolock and is a 17 hectare Dublin City Council owned site. It has been earmarked for development for four years and will be a mix of regular, social and affordable housing. One of the commitments laid out in Rebuilding Ireland – the government’s housing plan – is that publicly-owned be developed with mixed-use housing. As part of this, a number of sites were identified for development, the Oscar Traynor Road site among them (other sites include O’Devaney Garden and St Michael’s Estate). In May 2017, then-Housing Minister Simon Coveney said in response to a Parliamentary Question that he estimated that construction on the site could begin in the second half of this year. However, as of the end of last year no developer had been found for the land and construction was yet to begin. Spokesperson for Unite Behind the Locals – which is made up of different residents’ groups – Brendan Dalton said locals were “fed up and very concerned” about the lack of progress. “We did everything we could to try help make this happen, but we are still waiting for something, anything to bring this forward,” he said. 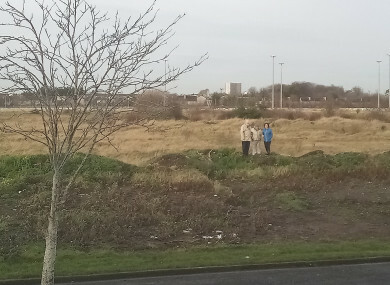 Plans to build homes on this site are moving at a snail’s pace and no one knows why. Dalton said that of residents took part in a recent rally to show solidarity with people waiting for the homes that have yet to be built. A spokesperson for Dublin City Council said that the project was “not stalled”. They said that it was always intended that the process of procuring a developer would be in the order of O’Devaney Gardens, then the Oscar Traynor Road and then St Michael’s Estate. The spokesperson described that procurement process as “complex and onerous” but said they were satisfied that good progress had been made and that the first stage of the Oscar Traynor Road process had been completed (the shortlisting of the tenders). “It is anticipated that a successful Developer will be selected for the Oscar Traynor Road project in the early months of 2019 which will be followed by a Planning Application to Bord Pleanála with full consultation with the local Project Consultative Forum,” they said. Email “Local residents 'fed up' at delays in building 640 homes on Oscar Traynor Road”. Feedback on “Local residents 'fed up' at delays in building 640 homes on Oscar Traynor Road”.